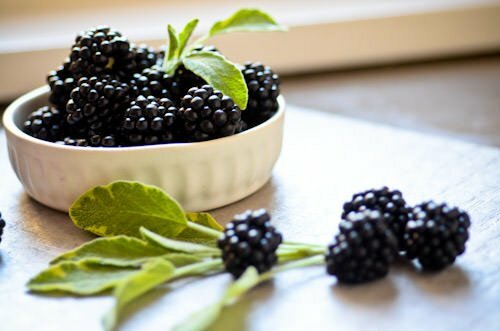 I posted a photo of the flat of blackberries that I came home with and here is the first thing that I made with them. I don’t drink alcohol but I do drink a lot of diet soda, a habit that I’d like to break. This is a refreshing, easy way to make a soda that’s lower in sugar and tastes great. 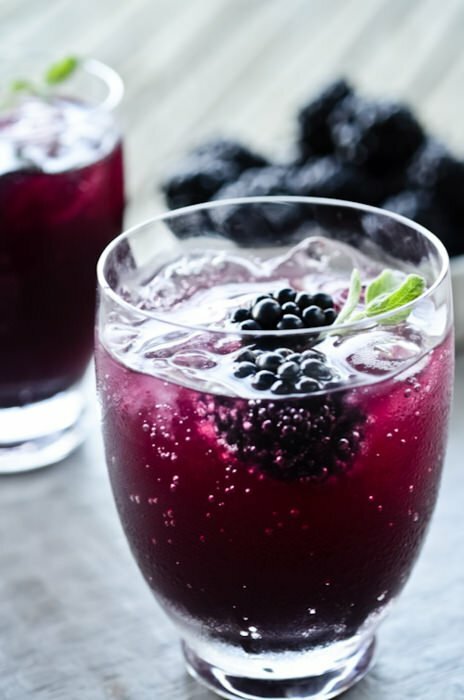 A sage simple syrup is mixed with some pureed blackberries and topped off with some club soda. The perfect refreshment for a hot summer day! 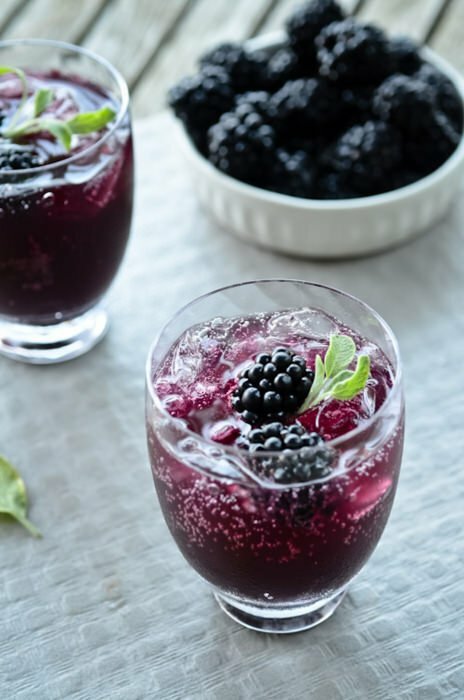 To serve place a tablespoon of the blackberry puree in the bottom of a glass, add a tablespoon of the sage syrup and top off with 8 ounces of club soda. saw your post about wanting to quit diet soda……you can use all natural Stevia as a replacement!Won’t add calories, won’t mess with blood sugar,is healthy for you. Diet sodas destroy your health. If you would like more info, please message me. 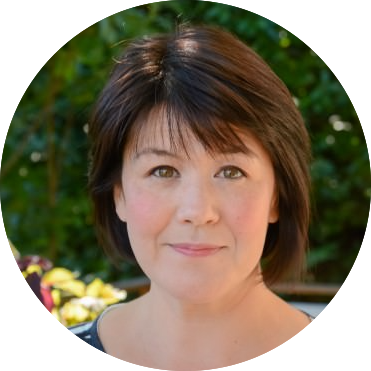 Have enjoyed your recipes…..Thank you! LOVE this idea! 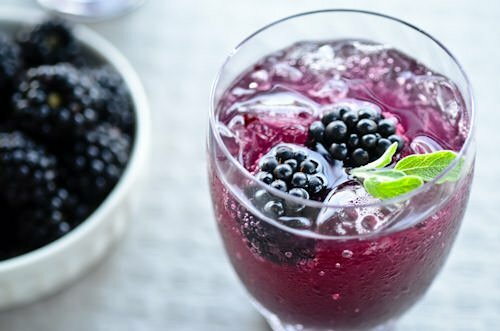 I think that basil/blackberry would be a nice combo too 🙂 Thanks for sharing! 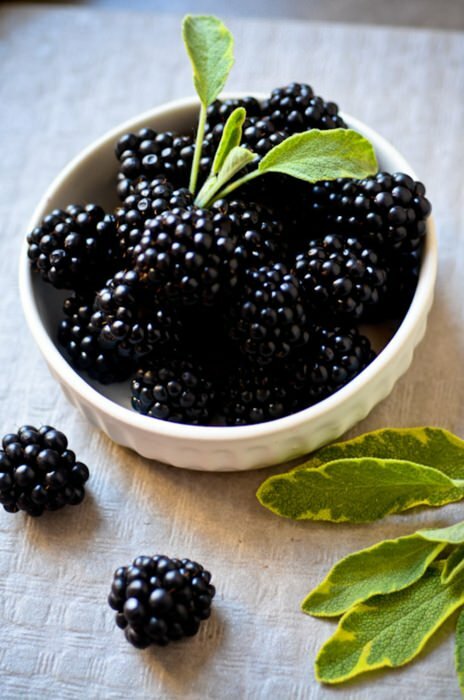 Blackberries pair so well with herbs, I love them with mint as well. Actually I love almost any kind of fruit and herb combo. I’m always amazed at how much flavor you can get from the addition of a few sprigs of mint or basil. One of the things I miss the most in the winter is not having access to my herb garden so I have to make due with what I find at the store! Hi there! This recipe looks fantastic! I’m planning on making it for a baby shower, any idea how many servings this will yield? Thanks! The recipe should yield about 8-10 servings if you use 1 tablespoon of each. Hope you enjoy it if you try it, it’s perfect for the warmer weather on the horizon! Way to go! I’m so glad to hear you say you’re quitting sodas. My sister was addicted, yes, addicted to Pepsi and died of colon cancer. I truly believe there was a connection, even if it was just the sugar. And artificial sweeteners are worse. I do use stevia, which is not artificial.